TRITon is a research and innovation project funded by the project members and the Autonomous Province of Trento (Provincia Autonoma di Trento, PAT) aimed at advancing the state of the art in the management of road tunnels, specifically to improve safety and reduce energy costs. To achieve these goals, TRITon will merge research on state-of-the-art technology into the established practices of road tunnel infrastructures, supported by project members that include local research centers and companies working in the field. An example application, central in TRITon, is adaptive lighting. 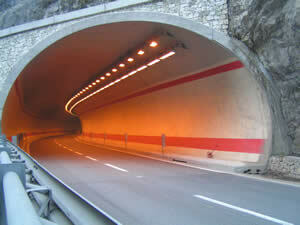 In current deployments, the light intensity inside the tunnel is typically regulated based on design parameters and the current date and time, and regardless of the actual environmental conditions. As it can be experienced when driving through a road tunnel too bright or too dark, this potentially determines a waste of energy, as well as a potential safety hazard. In TRITon, the light intensity inside the tunnel will instead be regulated through a wireless sensor network (WSN). This will relay sensed light information to the control station, which will exploit such information for fine-grained adaptation to environmental condition, significantly reducing costs and improving safety. A dedicated laboratory has been established to support TRITon's research and development activities. However, to bring state-of-the-art research and technology like WSN into road tunnel management, the traditional lab-centered research is not sufficient. Indeed, TRITon will transfer its results in real test-sites, four operational tunnels on road SS 45bis near Trento. This will provide not only the ultimate test for the project outcomes, but also a direct and measurable benefit to the local population.